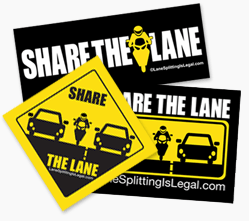 Nevada’s lane splitting bill, AB236, first heard by the Assembly Transportation Committee on March 28th, 2013 has passed committee in amended form, with only two committee members opposing – Maggie Carlton and Paul Anderson. Next step – the bill goes before the full Assembly and the Senate. Assemblywoman Carlton opposition to the bill is based on her fear of “motorcyclist’s guts end up all over the back of my car.” She reiterated her concerns in this work session, saying she sees lane splitting “as very, very dangerous and I just can’t support it.” Assemblyman Anderson, who has lived in Southern California where he “left a few mirrors behind on the freeways” shared Carlton’s concerns, albeit in a less gruesome manner. Instead of requiring a person who was lane splitting to drive in a cautious and prudent manner, the amendment requires that the person drive in a manner that is reasonable and proper, having due regard for the traffic, surface and width of the highway, the weather, and other highway conditions. Must not exceed a maximum speed of 30 miles per hour. The effective date of the bill is changed from October 1, 2013, to January 1, 2014. These are minor changes in the language – we knew most of this was coming from the previous hearing. As we said when this bill was introduced, it’s simple and smart. Be cautious and keep your speed reasonable – which we should all be doing when splitting lanes. Check out the full work session document below, and our previous coverage of AB236 for hearing video footage and more documents. We’ll update this post with video and additional information as it becomes available. Here’s some footage from the work session. We unfortunately missed the first few minutes. And here’s the work session document with amendment text. BEAUTIFUL! Freakin’ beautiful! Other than wanting the two opposing members voted out of office, I’d say I’m pretty pleased! Now if we can just get some traction on the Oregon bill. It’s amazing that Assemblywoman Carlton keeps conjuring up these images of kids’ arms being broken by lane splitters. And the statement about leaving mirrors on the freeway by Assemblyman Anderson was a bit much too. That’s ok – they weren’t able to convince anyone. Bravo to Assemblymen Daly, Carrillo and Healy for getting this rolling! Carlton is a classic liberal who is unable to have a logical though.. she can only use emotion and FEAR (False Evidence Appearing Real). And if the other guy has left that many mirrors on the road, he really should consider either a narrower bike or not splitting. I think he was trying to say that lane splitting riders in SoCal are so naughty they were always knocking mirrors off. He echoed some of Carlton’s sentiments, just less bloodily. Carlton just needs some riding lessons if he’s riding beyond his means. left mirrors? I hope he stopped and had an accident report done every time. I’m a las vegas resident, riding bikes (big) for the last 19 years. I have 3 now, including a 2012 goldwing. I can’t wait for this to be passed. What I find disturbing is that the two in opposition were not able to look past their gut emotional reaction and look at the arguments for lane splitting. They could have said something objective like lane splitting could be hazardous as motorcycles are harder to spot in the rear view mirror before the motorist changes lanes or some crap like that, but instead they kept to their emotional “that’s too dangerous” type of reaction. I hope this spreads across the country. Here in PA I’ll filter whether it is legal or not. I’m not going to put myself in a position to get hit by some inattentive motorist on his or her cellphone. 1 Pings/Trackbacks for "Amended AB236 Lane Splitting Bill Passes NV Transportation Committee"